March 19th, 2019, Charlottetown – Jenna Larter of Brookfield capped her season on a high note, skating to fifth place in the 500 metre distance at the Canadian Junior Selections short track speed skating event in Sherbrooke, Que., over the weekend. Larter was one of three Islanders who took to the start line, along with Peter McQuaid of Charlottetown and Andrew Binns of Stratford. The P.E.I. skaters were among sixty of the country’s top juniors in their respective fields who had earned qualification for the event. Jenna Larter skated to 5th in the 500m at the Canadian Junior Selections in Sherbrooke, QC. Photo courtesy of Yi Kay. 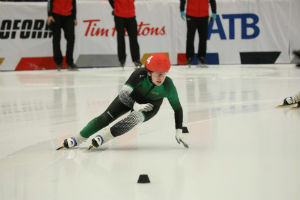 In addition to her fifth place in the 500 metres, Larter also reached the B final in the 1000 metre distance with a new personal best time, leading to 11th place in the distance despite a fall in the final. After suffering a penalty in the first round of the 1500 metre event on the opening day, Larter roared back in the overall standings, taking 13th place overall on the strength of her 500 and 1000 metre finishes. Binns had a successful debut at the national event, finishing 39th overall and third among the six athletes in the fifteen-year-old age group who had qualified for the competition. The Stratford native had his best placements in the 1000 metres, where he finished 29th, and in the 500 metres, where he bettered his own P.E.I. record for junior men by nearly a second. Binns stopped the clock in 43.979 seconds, enroute to 31st in the 500 metres. He placed 48th in the opening day 1500m after a penalty in his final race. Veteran Peter McQuaid had his best finish in the 500 metres, placing 25th after matching his seasonal best time in the distance. McQuaid had a pair of costly early round penalties in the 1500 and 1000 metre distances, placing 42nd overall. Island skaters are now preparing for the Canada East Short Short Track Championships in Campbellton, N.B. in just under two weeks, where a team of six Island skaters will line up against the best 11- to 15-year-old skaters form Quebec, Ontario and the Atlantic provinces. For full competition results and information on Speed Skate PEI, visit www.speedskatepei.ca.